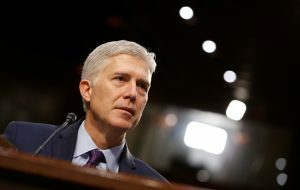 WASHINGTON — Justice Neil Gorsuch dived into the public side of his new job Monday, piping up early and often as he took his seat on the Supreme Court bench for the first time to hear arguments. The new justice waited just 11 minutes before asking questions in the first of three cases the court heard Monday, its first session since President Donald Trump’s pick was sworn in one week earlier. The 49-year-old Gorsuch echoed his own confirmation hearing testimony with questions focused on the text of federal laws and rules at issue before the court. He employed a bit of humor, expressed a modicum of humility, showed a hint of irritation and even channeled Justice Antonin Scalia, the man he replaced, with a touch of sarcasm. “Wouldn’t it be a lot easier if we just followed the plain text of the statute?” Gorsuch asked during the first argument, a highly technical case about which court federal employees go to with some discrimination claims. That question sounded a lot like the answer Gorsuch gave last month, when he was pressed to defend an opinion he wrote against a fired trucker. “Senator, all I can tell you is my job is to apply the law you write,” he said then. While some of the other justices slouched, rocked back in their chairs or leaned their chin or forehead on their hands, Gorsuch sat straight in his high-backed chair, to the far left of Chief Justice John Roberts. The justices sit by order of seniority, with the two longest-serving members of the court flanking the chief justice. The two newest justices sit on either end of the bench. The justices had removed one chair from the bench after Scalia died more than 14 months ago. Monday’s session was the first since then with the ninth chair restored, and nine justices present. He shared a laugh with his seatmate, Justice Sonia Sotomayor, before arguments began. The first case was so dense that even the justices who can wax eloquent over a misplaced comma were beside themselves. “Who wrote this statute? Somebody who takes pleasure out of pulling the wings off flies?” Justice Samuel Alito said to laughter. Gorsuch drew a few laughs of his own in an exchange with lawyer Christopher Landau, who is representing a former federal worker. “I think I am maybe emphatically agreeing with you and…,” Landau said. But at another point, when Landau said his client wasn’t asking the court to break new ground in its decision, Gorsuch launched a zinger reminiscent of Scalia. “No, just to continue to make it up,” he said. He also apologized to Landau for asking so many questions in a row. “I’m sorry for taking up so much time,” Gorsuch said. In the second case, he repeatedly tried to elicit an answer from lawyer Shay Dvoretzky. “If you’d just answer my question, I’d be grateful,” Gorsuch said, flashing frustration. The cases are expected to be decided before the end of June.